Aqua (Water) (Solvent/Diluent), Glycerin (Humectant), Polysorbate 20 (Emulsifier), Coco-Glucoside (Surfactant), Sodium Cocoamphoacetate (Surfactant), Benzyl Alcohol (Preservative), Phenoxyethanol (Preservative), Sodium Laureth Sulfate (Surfactant), Rosa centifolia (Rose Water) (Natural Additive), Sodium Chloride (Salt) (Viscosity Modifier), Chamomilla recutita (Matricaria (Chamomilla Recutita) Extract) (Natural Additive), Citric Acid (pH Adjuster), Methylparaben (Preservative), Disodium EDTA (Chelating Agent), Butylparaben (Preservative), Ethylparaben (Preservative), Isobutylparaben (Preservative), Propylparaben (Preservative). I think this compares well to more expensive products. I find everything struggles to remove waterproof mascara and I use this as a first step. The bottle is light and easy to use. Easy to use, works well and moisturises. 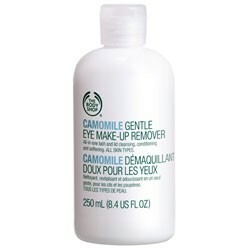 Another great cleanser from the body shop, this one is very soothing and feels nice on the skin. Light and works really well, deep down cleaning. Easy to use and comes off relatively easy. Pulls off stubborn mascara but works better if you let it sink in for a few minutes first.